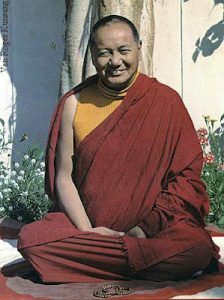 A teaching on karma given by Lama Yeshe at Chenrezig Institute, Queensland, Australia, on 28 June 1976. Edited by Dr. Nicholas Ribush. Excerpts from this teaching have been published in Mandala magazine, issues February 2004 and April 2004. There’s not just one, fixed, mathematical way of explaining karma; there are many different ways, including the subheading and numbered list approach. Sometimes it seems that people new to Buddhism find karma hard to understand, but actually, it’s easy to get a rough, initial understanding of it. Of course, once you get into the details, karma can be extraordinarily complex, too, but when I introduce it to beginners, I try to keep it simple so that they can get at least a basic, intellectual understanding. In reality, the only way you can get a total understanding of karma is through your own experience, and that experience is beyond words. Fundamentally, what is karma? Karma is your body, speech and mind. That’s it. It’s very simple. If I were to try to compare the subject of karma to the kinds of thing you study in the West, I’d say that it parallels in some ways the theory of the evolution of everything that exists. Karma encompasses everything on Earth and beyond, every existent phenomenon in the universe, throughout infinite space—in Buddhist terms, every phenomenon in samsara and nirvana. Karma is the energy of all phenomena and has nothing to do with what your mind believes. If karma encompasses all relative phenomena, are these phenomena interconnected? Well, even modern science understands that all the energy in the universe is interdependently related; it’s not just Buddhist dogma. For example, where does all the green vegetation we see around us come from? It doesn’t arise without cause. First there has to be a cause; then, the effect—the relative appearance of the green—arises. Similarly, each of us also has a cause; we, too, are interdependent phenomena. We depend on other energies for our existence. Those energies, in turn, depend on yet other energies. In this way, all energy is linked. You probably think your body comes from the supermarket: as long as the supermarket’s there, you can eat; as long as you can eat, you exist. Obviously, it goes much deeper than that. Therefore, your conception of what you are—“I am. I’m this; I’m that; I’m this—is like a dream. Intuitively, your ego has this notion that you’re independent, that you’re not a dependent phenomenon. That’s complete rubbish. If you look, you can easily see how you’re interdependent. It looks complicated; it’s not complicated. It only becomes complicated if your mind thinks it’s complicated. Your mind makes things up; that’s karma, too—an interdependent phenomenon; it exists in relation to other energy. If you understand the basic simplicity of this, you’ll be more careful in the way you act because you’ll realize that every single action of your body, speech and mind produces a reaction. We describe samsara as cyclic: it’s like a wheel, it goes round; one thing produces another, that produces another, and so it goes on, one thing pushing the other. And each karmic action is like the seed that produces a flower that in turn produces hundreds of seeds, which then result in hundreds more flowers that produce hundreds more seeds each. In this way, in a relatively short time, one seed produces thousands and thousands of results. The actions of your body, speech and mind are the same. Each action, positive or negative, good or bad, produces an appropriate result. Also, karma doesn’t depend on your believing in it or not. The mere fact of your existence proves the existence of karma. Irrespective of whether you want to know about karma or not, whether you believe in it or not, it doesn’t matter: you are karma. Whether you accept karma or reject it, you can’t separate yourself from karma any more than you can separate yourself from energy. You are energy; you are karma. If you’re a human being, it doesn’t matter whether others think you’re a human being or not—you’re a human being. It doesn’t depend on what you think, either. The truth of all existence doesn’t depend on what people believe. But whether you believe or not, your suffering and problems have a cause. They don’t depend on what you believe. Do you think you suffer only because you think you suffer? No. Even if you say, “I’m not suffering,” you’re suffering. Suffering comes along with your very life. Therefore, I often say that the Buddhist connotation of religion is a little different from the Western one. But when I say that, I’m not saying Buddhism is better; it’s just different. Its analytical approach is different. We often talk about how we waste our lives following the eight worldly dharmas—attachment to temporal happiness, receiving material things, being praised and having a good reputation and aversion to their opposites: discomfort, not getting things, being criticized and notoriety. Each time we get involved with those, we create negative karma. For example, when somebody praises you, you feel happy and puff up with pride, and when somebody criticizes you, you feel unhappy and depressed. Each time you go up and down like this, you create karma. Why do you feel elated when praised and dejected when criticized? It’s because you don’t accept the way things truly are. You’re controlled by your hallucinating mind, which is totally divorced from reality. Whether you’re good or bad isn’t determined by what other people think but by your own actions. These are your own responsibility. If all your actions are positive, even if I say “You’re bad, you’re bad, you’re bad…” all day, it won’t affect your qualities. Therefore, you should understand what really makes an action positive or negative. It’s not defined by what other people think. This is scientific fact, not religious dogma. If you go up and down because of what other people say, you’re hallucinating; you’re not seeing reality. You should have strong confidence in your own actions and take full responsibility for them. Then, even if all sentient beings turn against you, you’ll still be laughing. When you know what you are, you never get upset. If, on the other hand, your body and mind are weak, if you have no self-confidence and feel insecure, then of course you’re going to experience problems. All your feelings, perceptions, discriminations and the rest, especially those mental factors that bring negative reactions, arise from the hallucinating mind. Therefore, quite early in their training, I teach my students to meditate on the nature of feeling. We always think that whatever we feel—physically or mentally—must be right. Similarly, we think that whatever we see is real; we really do believe in what we see. I’m not talking about spiritual belief in the supernatural; I’m saying that we believe in the concrete reality of what we see around us every day. Do you think that’s right or wrong? It’s wrong. For example, say that you’re tremendously attracted to a particular object. At that time you have a certain fixed idea of what that object is. But you’re fantasizing; it’s a hallucinated fantasy. If you check your mind of attraction closely, you’ll see that its view is totally polluted and that what you perceive is a fantasy—neither the reality of the object nor that of the subject. A kind of cloud has appeared between your mind and the object and that’s what you see. All delusions arise in that way. So, in the end, who has more beliefs—a religious person or an atheist? It’s the atheist. Atheists are prone to say, “I don’t believe anything,” but that’s just their ego speaking. They believe what they see; they believe what they feel; they believe what they think. For example, atheists consider certain things beautiful—that’s belief. This is the scientific truth of the situation. It doesn’t matter whether or not they use the word “belief”—they believe; they’re completely captivated by belief. I can make the definitive statement that if your mind is clouded by the dark shadow of ignorance, if attachment rather than free communication is driving your personal involvements, you’re a believer. This is simple and logical. That’s why I always say that Dharma is very simple. It reveals the reality of yourself, your life and the things around you…the reality of everything. That’s the meaning of Dharma. When some people go into a supermarket, they see the incredible display of goods as a reflection in a mirror. It’s like when you look into a mirror, you see your reflection but at the same time you know it’s not really you. That’s how those whose view of the nature of the supermarket is closer to reality see it—like a reflection. Therefore, they can control any attachment that’s likely to arise. Those whose view of the world is that of a more concrete reality see the goods in a supermarket as fantastic and can’t stop their senses from vibrating. That’s the nature of ordinary attraction. Objects to which you’re attached make you tremble with desire and things that you hate make you shake with anger. Either way, it’s because you don’t understand reality. Actually, those who really understand the absolute nature of the supermarket don’t see anything at all. The whole thing disappears. That might be too much for you to comprehend, but there’s truth in what I’m saying. In conclusion, then, no matter how negative the things you’ve done, if you have powerful understanding, you can purify them completely. There’s no such concrete negative action that can never be purified; there’s a solution for everything. Some Christians speak of certain concrete sins that send you to a permanent, everlasting hell. I’m not criticizing; it’s a philosophical point of view. It’s good; it has a purpose. Any philosophy with a purpose is always good. But you should never think, “I have created such horrible negative actions that I’ll never be able to overcome them.” That’s an incredible devaluation of your human nature. Any kind of negativity, no matter how great, can be purified. That’s the power of the human mind. That’s why the lam-rim starts out by teaching how great our human potential is. We have to understand the true value of our life. We always seek value externally. People even lose their lives in pursuit of material things or recreational pleasure. What a ridiculous waste of life! Check within yourself very skillfully to see if you value material things more than your internal potential. That will show you how much you understand.